Giving in to public pressure, Arunachal Pradesh government on Monday froze its decision on the controversial permanent residence certificate (PRC) that triggered widespread violence for a third day, leading to the torching of the Deputy Chief Minister's house. Chief Minister Pema Khandu appealed to the protestors that their emand had already been accepted by govt on February 22. PRC issue is closed. I request them not to hold protests and dharna and cooperate with government, urged CM Khandu. I would like to assure the people in Arunachal Pradesh that government will not take up the matter even in future. This is a clear message, he said. Khandu had convened an all-party meeting on Sunday night to discuss the prevailing situation but it was later postponed to Monday. "The all-party meet, which was scheduled to be held on Sunday night has been rescheduled for Monday. The Chief Minister will also chair a meeting of all community-based organisations to discuss the PRC," an official in the Chief Minister's Offices said. Sources, however, said the meeting was postponed as other parties refused to take part unless the Governor summons it. Earlier on Sunday, Chief Secretary Satya Gopal said in a statement: "Considering the present situation in respect of the matter pertaining to grant of PRC to non-Arunachal Pradesh Scheduled Tribe residents of Namsai and Changlang districts, the government has decided that no further action shall be taken in respect of grant of PRC." On Sunday, a mob set fire to the house of Deputy Chief Minister Chowna Mein. Security forces resorted to blank firing as the the unruly protesters defied curfew and marched towards the Chief Minister's residence. Two persons were killed and three injured in police firing as protests over recommendations of granting permanent resident certificates (PRCs) to six communities escalated on Sunday in Arunachal Pradesh, police sources said. The protesters also set fire to and vandalized two police stations in Itanagar and adjoining Naharlagun, while a Superintendent of Police officer was reportedly injured. Ford, Nissan, Hyundai, Renault and Mahindra showrooms were vandalized. 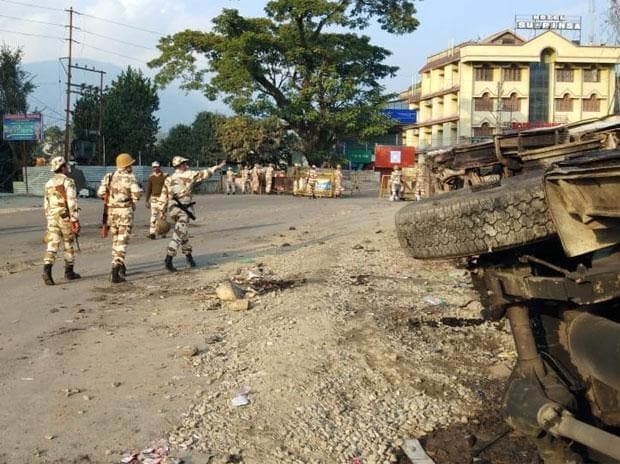 The agitators attacked the Itanagar Police station and several public properties in the state capital, police said, adding that they allegedly damaged the Sohum shopping mall here and looted the valuables, besides setting ablaze a market complex in Naharlagun. An indefinite curfew was clamped in Itanagar and Naharlagun on Saturday as protesters resorted to stone pelting in which 35 people, including 24 police personnel, were injured. The Army had also conducted flag marches in Itanagar and Naharlagun on Saturday. Internet services remained suspended, while markets, petrol pumps and shops were closed. Most ATMs in the state capital were out of cash, police said. Over 150 vehicles were damaged by the protesters since Friday, they said. On Saturday, the agitators damaged the stage of the Itanagar International Film Festival at the Indira Gandhi Park here. The organisers later called off the film festival. The agitators have been demanding permanent resolution to the PRC issue, immediate resignation of the chief minister, unconditional release of protesters (numbering around 40) and immediate transfer of the chief secretary, among others. The Nyishi Elite Society (NES), apex body of the largest community, has appealed to the people to remain calm and use maximum restraint to evade further escalation of violence. It also condemned the state government for "late and inept" handling of the bandh call given on February 21 and 22, and "failing to read the pulse and demand of the people". Union Home Minister Rajnath Singh appealed to the people of Arunachal Pradesh to remain calm and maintain peace. Meghalaya Chief Minister Conrad Sangma said the Pema Khandu-led Arunachal Pradesh government is not going to table the controversial PRC for now and appealed people to maintain peace in the state. Speaking to reporters, Sangma said, "Government has clarified that they will not stretch the issue further. We appeal to the people that there will be peace. Government is also trying its best that distinction is not escalated further. The state government has sent a message that they are not going to tabled PRC for now. Hence, there should not be an issue."